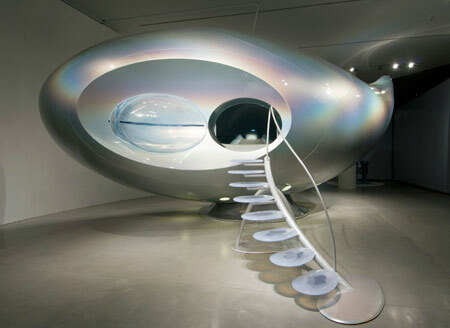 Mariko Mori started her career as a fashion designer and model in the late 1980s. Not surprisingly, Mori’s early works use her own body as the subject and she costumes herself as a technological alien woman in everyday scenes, loosely playing on Japanese pop culture and the cyborg theme. However, from 1999 onwards Mori departed from the use of her own image and instead began to create entire environments to facilitate the viewer’s own transcendental experience. Her work did expand beyond the colorful hyperreality of Play with Me to include a fascination with ancient cultures. Among cultures explored in Mori’s work are the prehistoric Jomon culture in Japan and Celtic traditions in Europe, investigating a more abstract minimalism and celebrating the enlightening and expansive qualities of technological innovation and its interaction with its surroundings. The work is part of an exhibition called Rebirth: Recent Work by Mariko Mori at the Japan Society in New York which contains 35 sculptures, drawings, photographs, sound and video work which together deliver a narrative of birth, death and rebirth—a continuous circle of life force that Mori observes on a cosmic scale.